My daughter came home from school today and told me about how the moon was made. 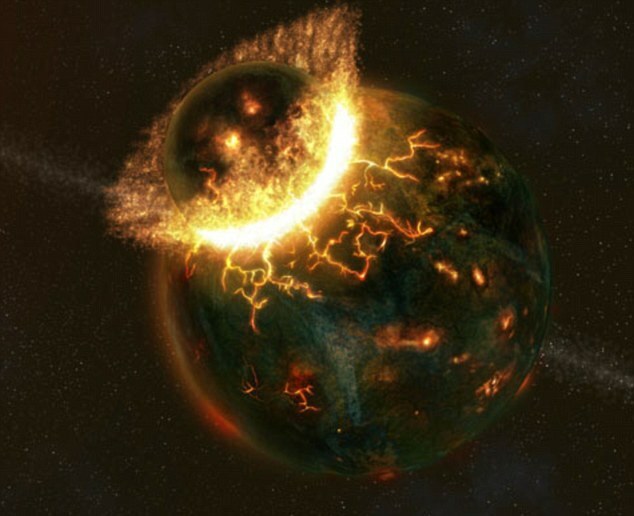 It seems that along time ago in a galaxy that isn’t far away… a plantary body about the size of Mars crashed into earth causing the crust of the Earth to to explode. The planet was destroyed but created a bunch of debris that then began orbiting the Earth. Over time the debris began crashing into “each other” and eventually formed one big chunk which began rotating creating a gravitational pull that pulled all the other rocks and rotating pebbles towards it. Eventually, over time… a lot of time… it formed a perfectly spherical and became known as the Moon billions of years later when life forms that had evolved on the Earth began to speak. This is also how the Earth started spinning…. You see the Planetary body’s impact on the Earth caused it to spin for the first time. And gravity was born. Yes we spin because it first hit us and somehow that spin just keeps on spinning. This totally squares with the way we see life today. For example… a few years ago my wife was in a car accident and two wheels came off her car as a result of the impact and they rolled down the road and would have formed a motorcycle if it hadn’t had been for the ditch that some human had dug when they built the road. Just the other day I saw a boy kicking up dirt on a baseball field that created a bunch of debris in the air. It would have created… I am sure… a rock of some sort but his mom stopped him from continuing his evolutionary activity. I was saddened by this because I wanted to see the experiment work. and yes I am making fun of the story of Moon creation my child was given in school today. It is amazing to me that people who believe in creationism, (and I am one of those) who believe there is an intelligent being – God – who created the heavens and the Earth (this includes the moon) are seen as people who are stupid and weak minded for putting their faith in God’s account of how He created things. Which is really more far fetched? That all this that we see just happened from nothing and evolved to where we are today? Or that there is a being out there who created all of this?